An NTU academic has collaborated with students to launch a magazine celebrating the world of independent publishing. Matt Gill is a lecturer within our School of Art & Design, and has worked with students on our BA (Hons) Fashion Communication and Promotion course to create the first edition of Metazine. The magazine has been inspired by a series of regular public lectures co-organised by Matt, called Raw Print, where guest speakers from the independent publishing world share their insights on modern magazine making. Each Raw Print lecture features two guest speakers, and the bulk of the content of the first edition of Metazine is made up of follow-up interviews carried out by Matt and his students with the speakers who took part in the Raw Print lectures during the 2014/15 academic year. Beautifully designed, Metazine actually looks more like a book than a magazine – and has been selling well and receiving positive reviews. Matt said: "We want to use Metazine as a vehicle to celebrate and champion what independent publishers are all about, and also to offer a vehicle to students for them to show what they are capable of doing." The Raw Print lectures have continued during the current academic year. Open to NTU staff, students, and the wider community, the lectures are organised by Matt in collaboration with Alex Smith at Ideas in Paper - a shop in Nottingham that sells a wide range of independent magazines and journals. Students are also involved in helping to run the events, and Matt is hoping that the current academic year's programme of lectures will ultimately lead to the publication of a second edition of Metazine. The sense of collaboration with the Raw Print lectures and Metazine also extends to the printing process for the magazine, with the first edition having been printed by Dizzy Ink – a company founded in Nottingham by NTU alumni Benjamin Kay and Craig Proud. Set up with support from The Hive, NTU's centre for entrepreneurship and enterprise, Dizzy Ink recently carried out a successful Kickstarter campaign, raising over £8,000 to launch a new open-access screen printing facility. This campaign was launched with the support of Raw Print at the Raw Print February event. 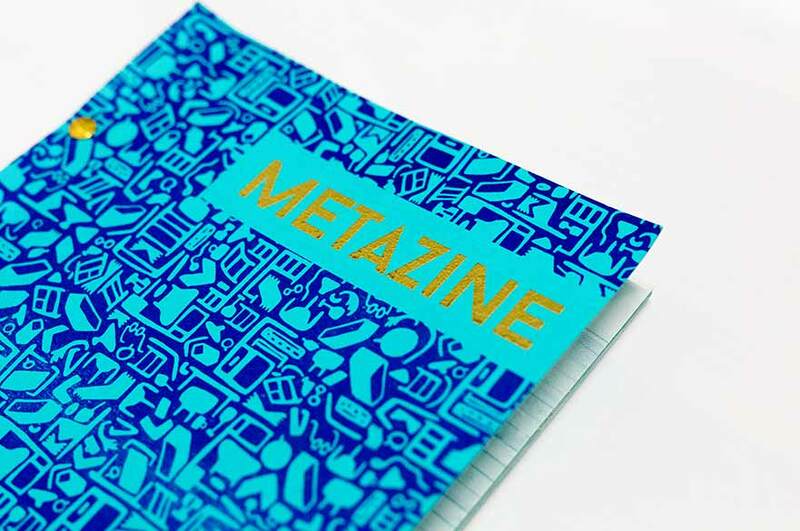 Metazine is available to buy in store at Ideas on Paper and online via the Raw Print website.